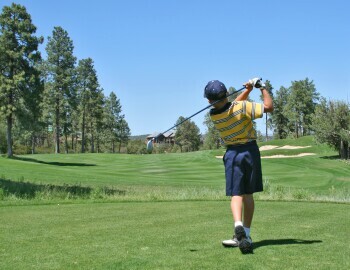 What ages and skill level are the Junior Golf Camps geared toward? Prince William Junior Golf Camps are offered to young athletes ages 6 through 17. Our programs are designed to accommodate players of all skill levels from beginner to advanced. Campers are supervised by our coaches both on and off the course. The majority of our camp sessions are spent out on the practice facility but our time there is by no means boring and overly repetitive. With our unique USGTF/The First Tee Junior Camp curriculum, we integrate learning with fun by combining skill development with games, friendly competitions, and many activities which serve as a vehicle for learning and let kids have a whole lot of fun at the same time! We are excited to welcome the “new junior golfer” in that one of our primary goals is to introduce the great game of golf to as many “future golfers” as possible. Our curriculum has been developed to make the introduction to the game relaxed, non-intimidating, and fun. We take your child’s safety as seriously as we take our own children’s. Our entire staff undergoes an extensive interviewing process and training. We also conduct extensive background checks on each of our employees. We only hire teaching professionals who have experience working with juniors and understand how to make children feel safe, supported, and encouraged. By registering for multiple weeks of camp, your child will experience continued game development, as our instructors will have the opportunity to really get to know your child, his or her game, and how to get the most out of your child’s experience. It is recommended that kids bring their own clubs to camp, however, we will provide clubs for those that do not have their own. Lastly, golf or tennis shoes are acceptable. Do I need to bring a camp info packet health form to camp? Absolutely. All campers are required to complete the health form prior to the camp start. Download Health Form Here (REQUIRED) We cannot and will not allow campers to participate unless the required health forms and waivers have been completed and turned in. Cancellations received at least 14 days prior to camp start date will be refunded less a $25 administration fee. Cancellations within 14 days of camp start date will receive a camp credit toward a future Junior Golf Camp less a $25 administration fee. This credit is valid for the remainder of the calendar year.